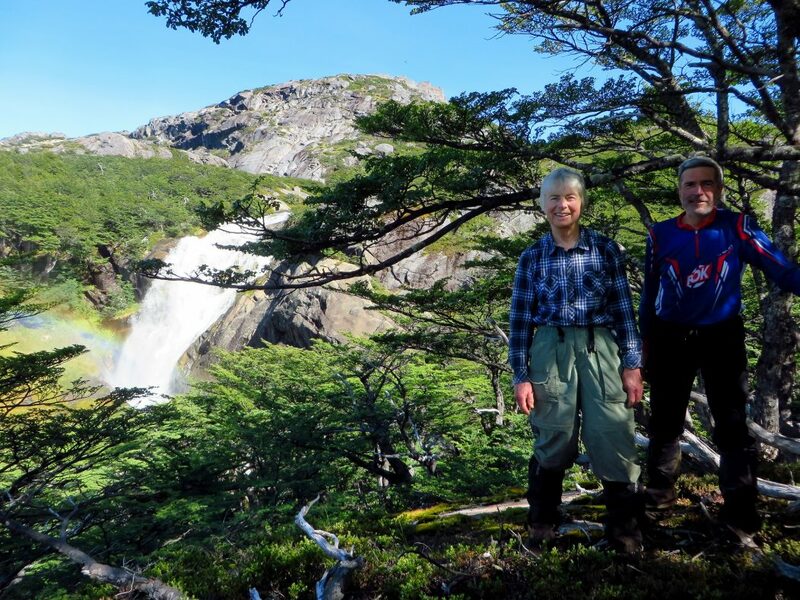 Swoop customers Mark and Katy did four treks in Coyhaique and Cochrane in February-March 2017. 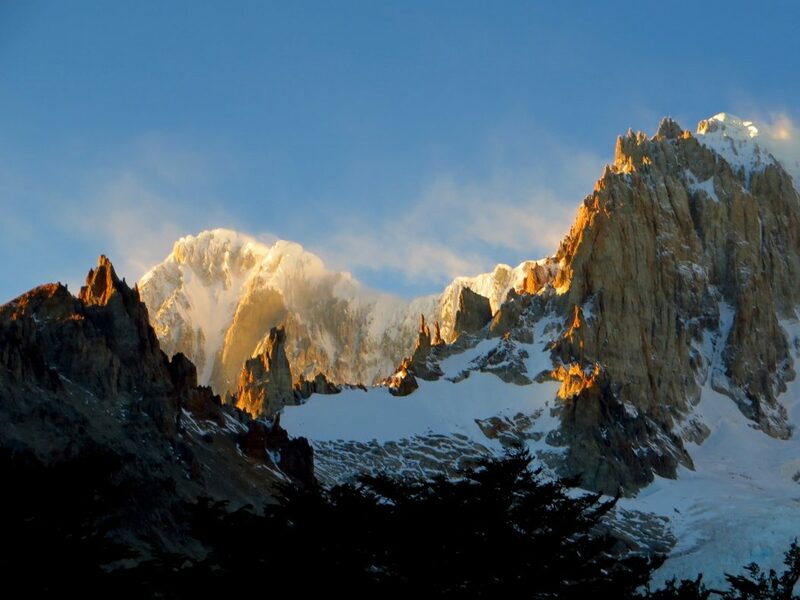 They keep fit and are accustomed to wild camping in Scotland, which was good preparation for their incredible off-the-beaten-track adventure in Patagonia’s lesser-visited region of Aysen. By way of a foreword, we’d like to share a little about the trials and tribulations of getting around Aysen. Transport to and from the treks is a challenge. Public transport is very limited, and the roads south of Coyhaique are nearly all gravel surface, even the highway to the south, the Carretera Austral. These surfaces deteriorate quickly with use, and any sort of road transport is rather a bone-shaking experience. The scenery is breathtaking everywhere: high jagged mountains covered with hanging glaciers, fantastic pinnacled ridges from which huge screes fall to the timber line, imposing rock towers, enormous rounded granite bluffs, vast alluvial valleys with braided rivers, blue lakes and lagoons, precipitous gorges and water-courses. Through all of these the narrow dirt roads twist, climb and descend, often with massive, unprotected drops only a very few feet away, passing occasional isolated cabins surrounded by some rickety fencing containing a horse and a couple of sheep. There is no need to leave the road to appreciate the scenery, and indeed some visitors never do. Not us, however. 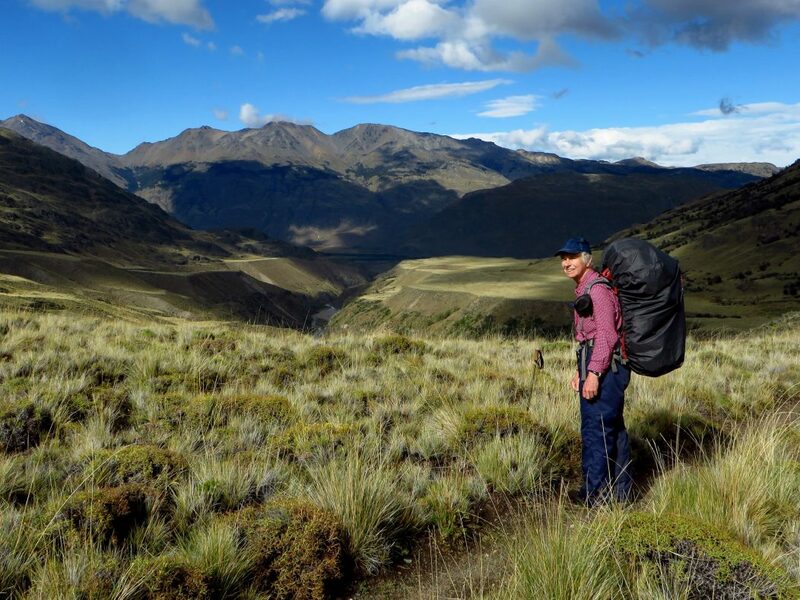 Our first trek was along the Cerro Castillo route, a four-to-five day trek through varied forest and mountainous terrain. After two days of relatively straightforward trekking we arrived at a delightful high-level campsite where we were on our own. Overnight rain stopped and day three started clear with superb views of yesterday’s route, but very soon high cloud drifted across and covered the pinnacles of Cerro Castillo. Admiring the hanging glaciers over an enormous, vertical rock wall, we climbed over scree around the lake towards a col and then steadily up a relatively gentle slope on ochre-coloured shale towards the southern shoulder of Cerro Castillo. Suddenly, about 500m from the high point, we were hit in full face by a strong gale force wind. Bent over to keep a footing, we struggled desperately to the top and then followed a nightmare descent on uncomfortable scree and a steep, eroded descent to the valley, where we found a very pleasant campsite in the forest, again on our own. The following day we walked in warm sunshine up to the amphitheatre at the head of the valley around which there are staggering views of glacial scenery, and then descended to the end of the trek. Here there is evidently some dispute with the local landowner over access, and it is necessary to negotiate a fence to reach the public track! Our second trek, in the Leones area to the southwest of Lago General Carrera, was more of an exploration, accompanied by Carlos, our unflappable guide. After a day and a half in perfect weather, we reached a large plateau containing three substantial lakes, formed originally by glaciers from the surrounding peaks. It was a wonderful area with the full complement of glacial features: big moraines, craggy peaks, hanging glaciers, scree slopes, as well as the deep blue waters of the successive lakes. In the middle of a delightful herb meadow there stood a large rock which we used for shelter from the wind during a substantial lunch stop. It was enormously tempting to camp and enjoy this beautiful spot further, but we knew there were more challenges ahead. So we continued up to a low col beyond the furthest lake, and suddenly there was the most breathtaking view, with a seemingly vertical drop to a valley far below and a whole range of snow-covered peaks on all sides. On the descent, even Carlos was taking the steepness quite steadily, and much of our progress was achieved by sliding down enormous boulders or hanging from vegetation on precarious mossy footholds. Once on easier slopes, we continued through well-vegetated forest and occasional swampy meadows. There was no path, so this was real exploration! We started early the next morning on what turned out to be a very long day. It started bright, but soon clouded over, drizzle came down, and by evening the rain was falling pretty steadily. It was rough going for the whole day; thick vegetation slowed us down, but the bigger challenge was the rugged terrain. Mindful of the lack of rescue services, we trod very carefully. Late in the afternoon we came to Lago Fiero. The murky water was full of ice floes from the glacier flowing into it, and in the dull weather with the clouds hanging over the mountains at the head of the lake, it was a classic Patagonian scene. From afar we could see an enormous sheer rock face going right down into the water. It was clear that we would have to climb over it and sure enough, just before we reached it, Carlos led a very steep climb over mossy rock for which again we used the vegetation to help pull us up. To avoid dangerous exposure we had to keep going higher over massive boulders, ever more slippery, with the darkness falling. Finally, when we could no longer see where we were going, we found an immense boulder with shelter underneath and decided to bivouac. Without a source of water we were unable to cook any food. It was an uncomfortable night. For one thing, the gap under the boulder was full of glacial rock flour, which covered everything in contact, and for another the rain eventually seeped in and gear started to get wet. Otherwise, it was just cold, and it was still raining in the morning. We shared the few fruit pastilles that were all the snacks we had, and set off again. 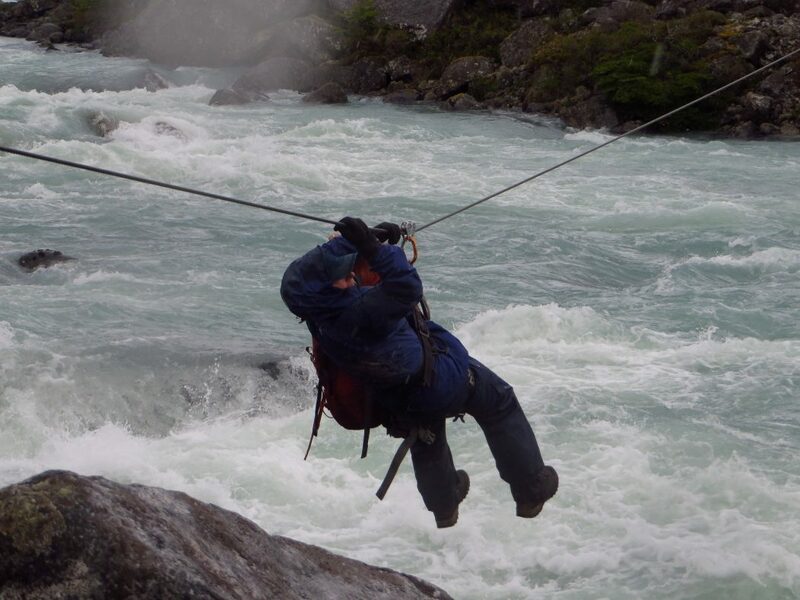 After several more hours of much the same terrain as the previous day, at last we reached the zipline crossing the outflow of Lago Fiero. A final couple of hours’ slog brought us to camp. 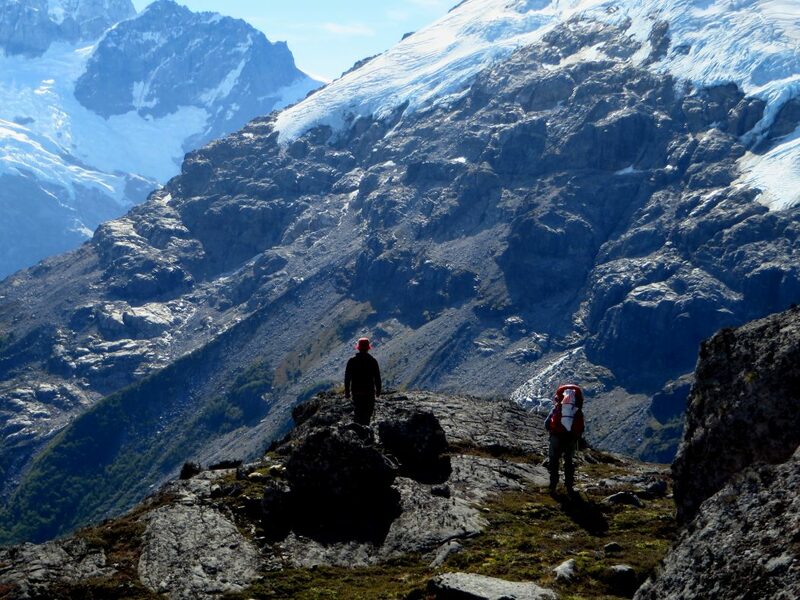 Our third trek was the Jeinemeini-Avilés route, in the new Parque Nacional Patagonia. The scenery here is quite different. Instead of the stark, snow-covered mountains, the sandstone hills are softer and have more colour, red and green indicating iron and copper. After paying our fee and receiving a useful briefing at the ranger post, we set off again across a bridge of dubious integrity. The walking was easy on a good track beside Lago Jeinemeini, partly forested but with drifts of white yarrow in the open areas. We crossed the Rio San Antonio river without difficulty, but on reaching Lago Esmeralda shortly afterwards we found it necessary to wade to get round. River-crossing footgear is essential! This was the end of the good track, and on the far side vast flats of river shingle stretched into the distance. From now on, we had to look for red-topped poles, which were none too plentiful, to maintain direction. For our final trek, we spent a few days based at the farm of Luis and Lucy de Soto in the area of Cerro San Lorenzo, the second highest mountain in Southern Patagonia. From here we took a day excursion to the Laguna del Tranquilo, source of one of the big rivers in the area. It was a pleasant change to have light rucksacks! Pushing through increasingly thick jungle we emerged eventually on to the lower part of a big lateral moraine. The only vegetation here was a continuous mat of crowberry, with occasional snow patches. At last the moraine levelled off and the full splendour of the scene became apparent. Below us, the pea-green water of the lake stood out against the huge barren moraines, whose precipitous slopes were surrounded by hanging glaciers and topped by substantial rock towers. To our left, a long scree slope descended to a snow-covered col, to the right of which an immense rock monolith towered 500m above us, and further to the right a glacier tumbled in a jumble of seracs towards the lake. Finally, turning to look back from where we had come, we could see the Rio Tranquilo tracing its way from its source in the Laguna, past the farm in the far distance and on towards the snow-covered Cordon Cochrane in the background. It doesn’t come any better than this. 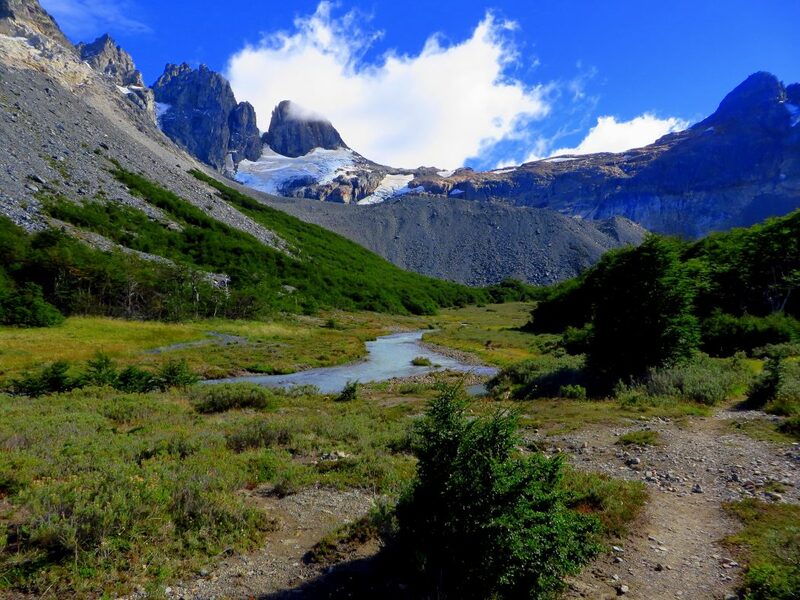 Aysen is a fascinating region, of which we saw only a small part, and thankfully at the moment it is spared the kind of tourist pressure that Torres del Paine experiences. We hope this article gives some impression of the variety of stupendous scenery, as well as the interesting birds (over 30 species seen) and plants to be found almost anywhere. One thing we have not touched on but which must be emphasised is the friendliness of everyone we met. People seem to possess a natural courtesy and lack of unnecessary reserve which makes travelling in the area a real pleasure. We had the support of a great team and we would like to acknowledge and thank all the people who worked so that our trip went smoothly. 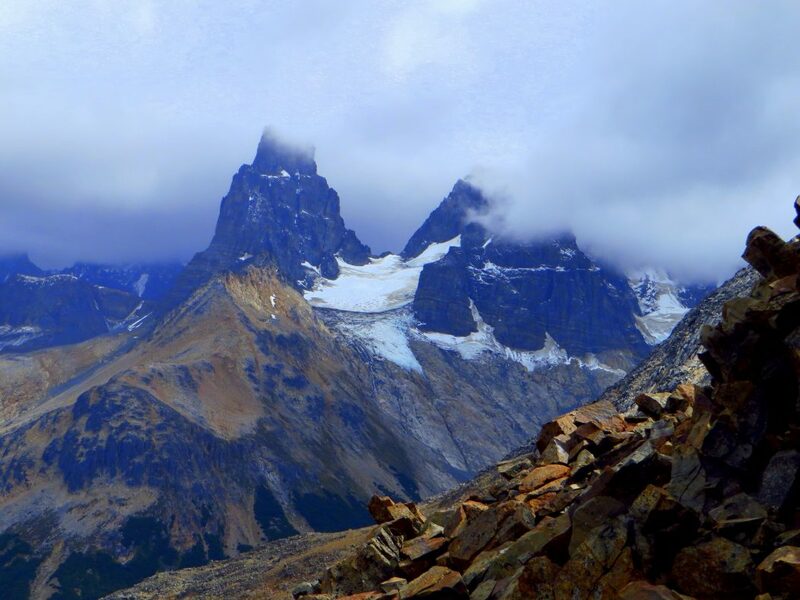 Perhaps it sounds an exaggeration to say that the trip was an adventure, but even with all the support we had, trekking in Patagonia is always going to be a bit of an adventure, in view of the weather, the nature of the terrain, the need to be self-sufficient, and the difficulties of transport and communication. Former government scientist and piano teacher respectively, Mark and Katy have lived in Bristol, UK for more than 20 years. Now in their late 60s, in the last ten years they have climbed 226 out of the 284 Scottish Munros, keeping fit by running and orienteering. They are both interested in all wildlife, and enjoy gardening. They keep a small yacht at Plymouth, and have cruised to the Scilly Isles and the Channel Islands. Katy studies Russian, and Mark studies French, but they both want to learn more Spanish before their next visit to Patagonia!